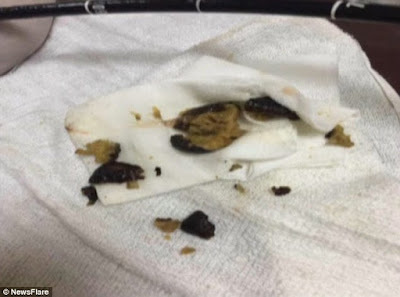 Doctors have removed a bunch of mushrooms that were stuck inside a woman's stomach. 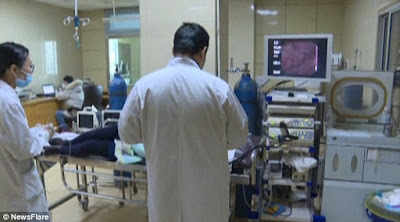 The Chinese medics believe they became lodged in the 50-year-old's intestines due to her not chewing her food properly. They also claim that she didn't allow the mushrooms enough time to expand in water before eating them - meaning they grew inside of her instead. After complaining of severe stomach cramps for a few days, the unnamed patient sought immediate medical advice - and was hospitalised. Chinese doctors conducted various medical scans to understand what was causing her problem before they made the surprise discovery. Filmed in Yiwu, Zheijang Province, they found that mushrooms as big as 7cm in diameter were living inside of her. Due to being short on time while cooking, the 50-year-old did not wait for her dried shiitake mushrooms to expand in the water, local reports suggest. Throwing them into her stew, she drank the mixture and swallowed several of the still-dehydrated organisms. They are believed to have expanded inside her stomach, causing the painful blockage the next day. The woman was taken into surgery and the mushrooms were removed piece by piece from her intestine. She has since recovered from the operation and is believed to have been discharged already. Doctors Mistakenly Remove Man's Kidneys During Surgery, Man Finds Out Days Later.